*Rhymes with fun & profit - get it? 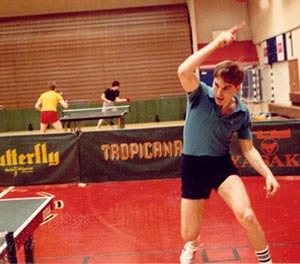 In the Beginning, God (I mean Sitco, I think they were first) created table tennis robots. They had many problems. They either hit to one spot on the table over and over, or they sprayed the ball about randomly, so you couldn't really do many table tennis drills with them. They were either set to heavy topspin or heavy backspin; there was no in between. And the ball was shot at you by spinning disks instead of coming off a paddle, like in a real game, so you didn't learn to read the ball off a racket. (There were other problems early on, such as catching the balls, recycling them, consistency, etc., but these problems were all worked out long ago.) Fixing these problems were, to me, the three holy grails of table tennis robots. This morning my desktop computer crashed. (I'm writing this on my netbook computer.) I had all sorts of stuff ready to write for my blog; I'd written half of it last night. But now I can't access it, and I'll probably spend much of the day trying to work out the computer problems. I've already contacted my friendly neighborhood computer expert (J-O, where are you? No, not Waldner), and hopefully all will end well. But rather than leave the multitudes without anything whatsoever to do or read today, here's an exercise. Are you ready to take your game to the next level and beyond? Let's do an exercise that'll help you do that. If you are a coach, this is also a great exercise for your students - work with them on this. First, write down what your long-term goal is, in terms of level. Be realistic, but at the same time don't be overly conservative. Give a general timeline to reach this goal.